Why do we teach information literacy? This book argues that the main purpose of information literacy teaching in higher education is to enhance student learning. With the impact of new technologies, a proliferation of information sources and a change in the student demography, information literacy has become increasingly important in academia. Also, students that know how to learn have a better chance of adapting their learning strategies to the demands of higher education, and thus completing their degree. The authors discuss the various aspects of how academic integrity and information literacy are linked to learning, and provide examples on how our theories can be put into practice. The book also provides insight on the normative side of higher education, namely academic formation and the personal development process of students. 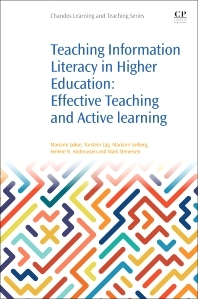 The cognitive aspects of the transition to higher education, including learning strategies and critical thinking, are explored; and finally the book asks how information literacy teaching in higher education might be improved to help students meet contemporary challenges. Library and academic staff teaching induction/IL courses in higher education; graduate LIS students. Teachers of didactical and digital competencies for higher education. Information literacy instructors. 4.1 Student Learning Strategies—What is Effective? 6.1 What Have We Learnt in School Today? Mariann Lokse is the Head of Department at UiY The Arctic University of Norway university library, the world’s northernmost university, located in Tromsø, Norway. Subject librarian for Art and Literature at UiT The Arctic University of Norway. Torstein Låg has a PhD in psychology and is a Senior academic librarian and the subject librarian for psychology, psychiatry and philosophy at UiT The Arctic University of Norway. Subject librarian for psychology, psychiatry and philosophy at UiT The Arctic University of Norway. Mariann Solberg has a PhD in philosophy and is a professor under the Department of Education at UiT The Arctic University of Norway. Professor of the Department of Education at UiT The Arctic University of Norway. Helene N. Andreassen, has a PhD and is the Head of Library in Teaching and Learning Support. She is also a senior academic librarian for Linguistics, Speech Therapy and Romance languages at UiT The Arctic University of Norway. Senior academic librarian for Linguistics, Speech Therapy and Romance languages at UiT The Arctic University of Norway. Mark Stenersen is a graphic designer at Result: Centre for Teaching, Learning and Technology at UiT The Arctic University of Norway. Graphic designer at Result: Centre for Teaching, Learning and Technology at UiT The Arctic University of Norway.